I have been a fan of Dermalogica skin care for over 20 yrs first started working with Dermalogica at a spa in the Jacksonville . Using their products on a daily basis gave me the opportunity to see what a great line they offered and still offer. This is a skin care line developed through research at The International Dermal Institute. I knew Dermalgoica was great because I saw results. What I didn't know was how much knowledge went into ingredient development .. The plant substances studied by scientific researchers for medicinal purposes matched up with the ingredients that went into Dermalogica's skin line. This was the first time I saw a skin care line using a scientific basis to build their product line unlike so many that claim patented skin technologies without regards to what is scientifically researched and studied. I have to say that Dermalogica fits perfectly with its name; skin care that makes sense. 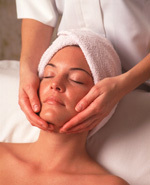 REFRESHER MINI $ 55.00- This facial is for those clients that are on the run. And just need something quick ! BREATHE DEEPLY $ 80.00- Our classic facial will leave your skin radiant and healthy looking. MANLY MAN $ 80.00 - For those guys combat issue’s of congested skin from ingrowing hairs. ENZYME PEEL $ 90.00 -This intense facial treatment increases firmness, reduces wrinkles and leaves skin pigment free. 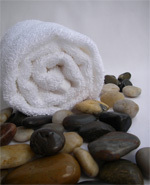 BACK FACIAL $ 80.00 - This uplifting treatment deeply cleanse, exfoliates and soothes blemished skin of your neck and back. ACNE ATTACK $ 90.00 - Using customized products to help reduce pimples and scarring. YOUTHFUL GLOW $ 93.00 - Restore your skin’s glow with a boost of vitamin A, C and K. It plumps up fine lines and wrinkles and minimize sun damage. PICK ME UP MINI GLOW $ 65.00 - It's a mini facial just like the Youthful Glow just a quick version. SKIN MAPPING BAR - Skin Analyze With Facial FREE !! Without Facial $ 20.00 Helps see what is going on with your skin. As in Sun Spots, Acne,Acne Scaring & much more ! Helps us choice what is the best facial for you. PLEASE SPEAK TO YOUR CLINICAL SKINCARE THERAPIST ABOUT POSSIBLE RESTRICTIONS ON YOUR FACIAL. Eye Treatment Soothing Eye Treatment $ 15.00 - Great for those tired eyes, puffiness & wrinkles. Relaxing eye mask & eye pillow. PRIOR CONSULTATIONS FOR DIAMOND MICRODERM, PEELS, MICRO CURRENT, AND MICRO NEEDLING ( SKIN PEN ) . PLEASE CALL TO TALK TO CLINICAL & MEDICAL SKINCARE THERAPIST. PLEASE LET USE KNOW IF YOU ARE USING RETIN *A*, ACCUTANE OR ANYTHING ELSE THAT MAY AFFECT YOUR SKINCARE INBALANCE. © 2019 BELLA SKINCARE STUDIO, All Rights Reserved.